The fourth-largest state in the United States, Montana is a hunter’s and outdoorsman’s paradise. Covering 147,000 square miles, Montana is split into distinct eastern and western regions by the Continental Divide. Most of the major mountain ranges (there are at least 100) are in the west. About 60 percent of the state, most of the eastern section, is prairie, but there are a number of isolated peaks and ranges that interrupt the prairie landscape. Huntable species in Montana include black bears, mule deer, white-tailed deer, pronghorn antelope, Rocky Mountain elk, Shiras moose, mountain goats, mountain lions, bighorn sheep, turkeys, wolves, and bison. There is also excellent hunting for upland birds and waterfowl in most of the state. Montana’s wildlife is well managed, with excellent trophies of nearly every big-game species being taken in the state every year. Some of the largest bighorn sheep in the world come from Montana, especially the Missouri Breaks region; however, drawing odds are extremely low. 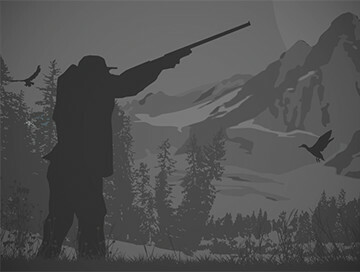 Hunting in Montana is conducted on both public and private land, and permission is required to hunt on private land. Outfitters and guides must by licensed by the Department of Labor and Industry. To hunt in Montana, you need a general big-game or species license as well as, in some cases, a permit entitling you to hunt in a specific area or type of animal. A Conservation License is also required. Consult with your outfitter and be certain that he or she is able to either provide the needed licenses and tags or instruct you on how to purchase them. Many of Montana’s hunting opportunities are only available through a draw system, which requires planning ahead. In some cases, however, licenses are available for purchase over the counter or outfitters have tags available for nonresident hunters. Big-game animals must be properly tagged before the carcass is removed from the kill site or before the hunter leaves the kill site. Montana requires that all hunters and guides must wear a minimum of 400 square inches of hunter orange visible above the waist. The rule does not apply to archery hunters hunting during the archery-only season, but it does apply to bowhunters hunting during the general big-game firearm seasons. It’s crucial to familiarize yourself with Montana’s hunting regulations before you begin your hunt, even if you are hunting with an outfitter. Rules surrounding season dates and hunt area boundaries can be complex, and because rules often differ from species to species and region to region, be sure to read up on specific regulations for you particular hunt. 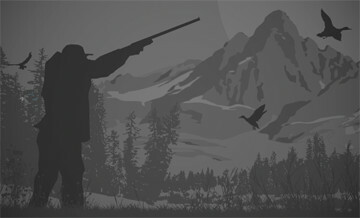 Find information at Montana Fish, Wildlife, and Parks (fwp.mt.gov) and specific hunting regulations here: http://fwp.mt.gov/hunting/regulations/default.html. These mixed upland hunts take place from our Ekalaka camp. Upland bird hunting here can result in a multi species game bag as pheasant, sharp-tail grouse and Hungarian partridge all reside here. We hunt these birds in December after the big game season closes for the year. An early December hunt here will have you chasing birds that have not been hunted prior to these hunts! We offer a very limited amount of these exciting hunts and you may bring your favorite dog or we can provide one for you. Conditions at this time of the year can be perfect for this type hunt. 1x1 per day, $600. or $1750. for a 3 day hunt. CALL NOW TO DISCUSS THE DIFFERENT HUNTS WE OFFER AND PERMIT OPTIONS AVAILABLE! Rifle Antelope, Room for 1 hunter,10-16-19 thru 10-18-19, 700-20 permit required. Montana has a four week long antelope season. Hunting for antelope here is almost all purely spot and stalk with an excellent chance of taking one of the most beautiful and exotic animals in North America. This hunt is for everyone and is perfect for couples or parent/child as it is not unusual to see over 100 antelope per day insuring nonstop action and hunting excitement. This area has great trophy buck potential!! Start planning now as this hunt is well worth the effort!! We help all clients throughout the entire license application process, the 2019 application deadline is June 1st. Nonresident License Information: Antelope license cost is around $210. and these are on a limited draw basis. If you’re a fan of serious upland bird hunting, this is the hunt for you! This northwest corner of Montana consistently has good populations of what are referred to in the west as mountain grouse; ruffed, blue and spruce and LOC has over 200 square miles of hunting area permitted by the Kootenai National Forest. Hunt over our experienced English Setters and retrievers or bring your own dogs. Either way, there's nothing more exciting than watching good dog work and knocking down some of the most challenging birds in some of the most spectacular country you'll ever hunt! Blue Grouse Blue grouse, the largest of the three species are found in good numbers throughout the area. They frequent subalpine terrain featuring open ridgetops with stands of conifers, and feed on a variety of insects, berries, and plants. They are slate gray and camouflage well against their rocky environment. Spruce Grouse Spruce grouse are found in healthy numbers and frequent deeper woods, thick coniferous areas, and feed on insects, clover, berries, and evergreen needles. They are darker than blue grouse and sometimes appear blue-black. Spruce grouse, while not considered flyers, are a lovely bird and make an interesting addition to the trophy room. Ruffed grouse Ruffed grouse, though populations are cyclical by nature, are found in great numbers. They inhabit logged areas with ten to thirty year old regrowth, coniferous forest edges, alder and aspen groves and creek bottoms. They feed on insects, clover, berries and other plants, are mottled brown or gray and are especially flyers. It has been said many times that ruffed grouse are the king of the upland birds, and we agree. To that end we devote most of time in pursuit of these fine birds. There’s nothing more satisfying than watching a dog flush or point a ruffed grouse and making a clean shot just before it disappears into the darkest cover.